Perhaps a country shows its true colors through its bank notes. In 1928, the US Treasury Department reviewed the portraits on bank notes and concluded that “portraits of Presidents of the United States have a more permanent familiarity in the minds of the public than any others.” Exceptions were made for Alexander Hamilton, Salmon Chase, and Benjamin Franklin. No changes in the people depicted on US currency (intended for the general public) have been made since 1928. I had never heard of Elizabeth Fry, so, as I paid for my latte and pain au raisin at the Caffe Nero recently, I asked the man behind the counter who the woman was on the fiver. The barista shrugged and said, “I guess she’s somebody who’s dead.” Minutes later, as I sat upstairs with my breakfast, he came up to my table and said, “She lived 1780 to 1845 and was a prison reformer.” Had this tourist’s question just kick-started the brilliant career of an barista-turned-historian? Not sure. But Fry seemed a woman worth knowing, so I looked her up. Elizabeth “Betsy” Gurney was born in Norwich to John and Catherine Gurney. Her family home is now part of the University of East Anglia. Her father, John Gurney (1749-1809), was a partner in Gurney’s bank. Her mother was Catherine Barclay, whose family was among the founders of Barclay’s bank. When she was 18, Elizabeth heard William Savery, an American Quaker, talk about the poor, sick, and imprisoned. She began collecting clothes, visiting the sick, and started a school to teach children to read. 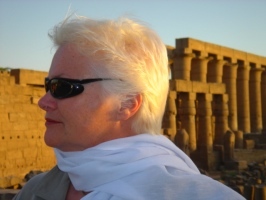 Two years later she met Joseph Fry (1777–1861), a banker and also a Quaker. They married on August 19, 1800 and eventually had five sons and six daughters. But her greatest contribution to the world was to English prison reform. Fry told people in the outside world about prison conditions at Newgate Prison, something most people–especially those within her class–did not wish to know. She was admired by the young Queen Victoria for her compassion, and she is regarded today as an early feminist. In 1835, she testified before the House of Commons Parliamentary committee, which had been charged with investigating the jails in England and Wales. After her shock at seeing the body of a young boy dead from exposure, Fry also began helping the homeless, establishing a nightly shelter in London. In 1840, she also opened a training school for nurses. Her program inspired Florence Nightingale, who took a team of Fry’s nurses to assist wounded soldiers in the Crimean War. 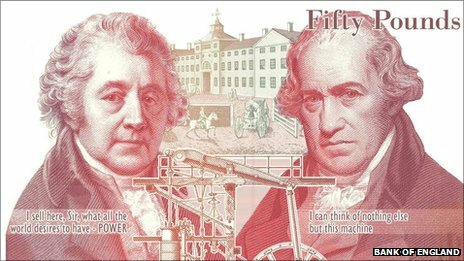 The newest portraits on English currency are on the 50-pounder, featuring engineers Matthew Boulton (1728-1809) and James Watt (1736-1819). Boulton, an Englishman, was a leading entrepreneur of the Industrial Revolution: developing, producing, and selling steam engines plus minting of high-quality coins. Watt, a Scot, greatly improved the steam engine. 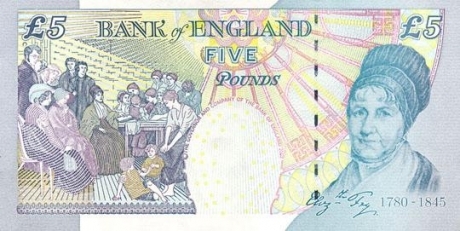 Bank note illustrations and designs change every few years in England amid much fanfare. And, as each design is brought out, the old notes have to be turned in or used by the time the new design begins circulation. Old bank notes with old portraits will not be accepted. Sometimes there is controversy about who should be honored. A feminist who lobbied for Jane Austen to appear on the 10-pound note (which will start circulation in 2017) received death threats. And, starting in 2016, Winston Churchill will replace Fry on the fiver. I for one will be sorry to see the old girl go. This was written by admin. Posted on Thursday, June 19, 2014, at 8:38 am. Filed under Travel Writing. Bookmark the permalink. Follow comments here with the RSS feed. Post a comment or leave a trackback. Hi! This isn’t really a comments, it’s a note that’s part of an effort to get in touch with Kathy Grossman. I knew Kathy in the mid 70’s when she lived in Cincinnati, Ohio. I was part of the country band she was in known as “Country Rye.” I’d LOVE to just reconnect with Kathy. She was so talented and such a great person. I hope this outreach to reconnect works! Thank you! ‹ Murder at the B&B. An Ophelia Perhaps Mystery.